Tim Barger’s collection of stories about his years growing up in Aramco are a study in impaired judgment and poor impulse control - yet they are entirely recognizable to any of us who lived in a place where you woke up to the muezzin and went to lunch at the whistle. 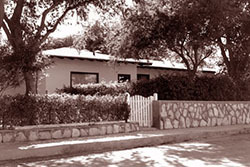 Living in a house very much like this one on 11th Street in Dhahran, Saudi Arabia, Tim Barger grew up in the 1950s thinking that blinding heat, humidity and howling dust-storms were normal. By seven he had already experienced several locust plagues and was looking forward to the next one. Arabian Son is a collection of stories about Barger and his friends' misguided attempts to amuse themselves in an oil camp lean on amenities and devoid of movies and TV. Crawling through hedges frosted with DDT, climbing hundred-foot radio towers, spelunking through a subterranean maze of air conditioning vents, ten-year-olds, they made the most of the world they had. Neither they nor their parents had the vaguest idea that Aramco would soon become the anchor of the global petroleum economy. The boys riding their bikes off of rooftops into dense hedges only knew that they were laughing themselves silly. They could not have realized just how soon their Dhahran would recede into the rear-view mirror to vanish into progress. My second day hanging around the job site, a plasterer took me aside and using some plaster on a shingle swiftly shaped a fish and then deftly transformed it into a bird as if he were some primitive Saudi Picasso. We were all stunned into silence – for about ten seconds – then we erupted in convulsions of laughter. We made our way up the AC ducting to the grill work and could see everybody on the other side raptly watching the movie. All the front row seats were occupied by kids we knew, the reflected light from the screen flickering across them in different colors and shades, the soundtrack blaring. They didn't know that we were there - just 10 feet away. Then the feature would burst on to that beautiful, big screen and all of us, adults and kids, would step into a world so far away from Dhahran that you couldn't measure it. The frontal lobe comes up with marvelous ideas like wouldn't it be fun to ride a skateboard down a steep hill that crosses a busy intersection? Or my favorite that actually happened – wouldn't it be a kick to grab one of those deadly poisonous sea snakes at Half Moon Bay and handle it until it bit you? Well, the money was for emergencies and being absolutely ignorant we had no idea what "two-drink minimum" meant but behind that beaded curtain was Lana, so we pulled out the cash and were ushered in. After a few minutes, backlit by the rising sun, a Russian wolfhound comes running down the surf line followed by a tall, beautiful young girl with blonde hair to her waist wearing a yellow bikini. She is gracefully skipping along like a gazelle on helium. Somewhat concerned, we approach Milt's lifeless form sprawled out under the streetlight. Half a dozen kids were bunched together like a stalk of asparagus with their arms up in the air undulating like a gigantic sea anemone. Strange James was in an air guitar paroxysm and everyone else was just flailing it up. Find a couple of fluorescent tubes and we would instantly have a dramatic and very brief sword fight that ended in a burst of shattered glass and a faint cloud of super-carcinogenic mist. 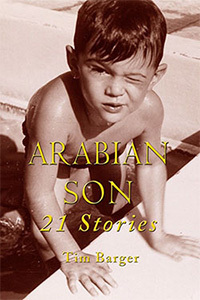 Earlier stories by Tim Barger are included in his collection Arabian Son.